Exceptional 87. 904 acre parcel of ground located in desirable carversville area of plumstead township in central bucks county, pa. Rare opportunity to purchase a property that affords the ability to build a luxury estate home in a secluded setting high on a ridge line providing breathtaking panoramic views overlooking the delaware river. Please see aerial view of the property and pictures. The views of the river looking into new jersey are stunning. This is one of the most secluded locations in all of bucks county affording a new owner the ability to create an exclusive high end subdivision containing a few very special choice building lots. 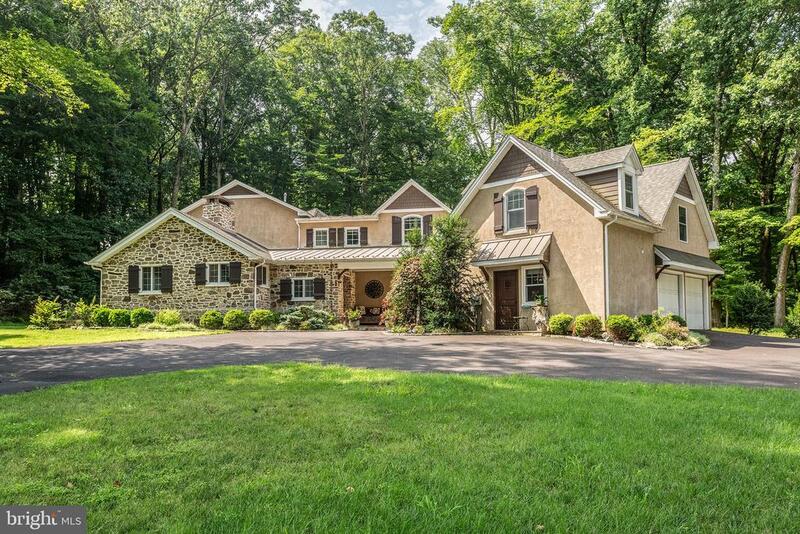 The location of this property is perfect for an equestrian estate or equestrian community as the property provides unique access to connect to a hillside trail system that meanders all the way down to the delaware river. Contact the listing agent today to schedule an appointment to take a guided tour of the property. 'Spring woods' is a distinguished stone and slate house located on 10 acres of park like woodlands that have been beautifully landscaped. As you enter the two-story foyer, a sweeping staircase is the main point of interest. To the left is the elegant dining room with hand-crafted wainscoting fit for the grandest holidays and formal dinner parties. To the right is the formal living-room with fireplace and windows that look out onto the front gardens. Off it is the library-study with handsome, polished bookcases and its own fireplace. Beyond that is a ground-level, spacious 1st floor master suite with two walk-in closets and luxurious bathroom with jetted tub, his and hers vanities and tiled shower. From the center hall moving further in is the spacious chef's kitchen with high-end appliances that one expects in a home of this quality and a casual dining area with its own fireplace. That leads to the family room which has light-filled windows allowing open views of the extensive gardens, full wall of cabinets and built-in shelving, walk-in fireplace, and wet bar. All these areas are ideal for separate activities or combined for large-scale entertaining. Along the whole rear of the house is a large trex deck that can be adapted to your lifestyle for al fresco dining and other activities, overlooking the tiered gardens with natural rock walls and woodland beyond. Upstairs is the master suite with all the features of a quality residence: a spa-like bathroom, large walk-in closets, and a connecting office with its own walk-out balcony. All bedrooms overlook the tranquil grounds of the estate. Additional features are an au pair/in-law spacious area complete with separate entrance, oversized garage, zoned heating and air-conditioning, and water purification. All mechanicals are newer, the pride of ownership shows completely thru the home. 'spring woods' is unique in solebury. We invite you to view it and make it your home. Excellent location with easy commute to nyc, phila, new hope, princeton and train stations. The diabase farm embodies the charm and serenity of a historic bucks county farmhouse yet offers a unique sense of community and belonging with the neighboring farms. This property honorably bears the indelible mark of being part of william penn~s ~manor of highlands~ and it~s 4. 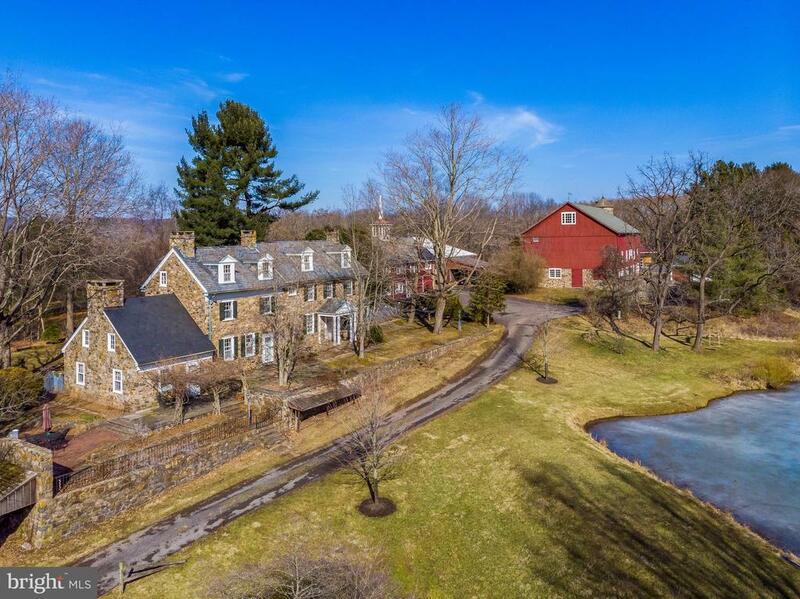 25 acres is part of a 133 acre preserve along with a classic red bank barn and outbuildings that have been carefully and thoughtfully restored. Every addition assumes some portion of the history of those who have lived within its walls. The original part of the home dates to 1750 and takes a step back in time with a built-in wet bar, wide planked chestnut floors, wood-beamed ceilings and a handsome original walk in fireplace with working baking oven. Adjacent is charming sitting area or office that opens to a magnificent blue stone patio with flowering trees and bushes creating a private oasis to enjoy that morning coffee or afternoon tea. It even boasts a little piece of history of its own with a ~secret look-out~. In 1988, john milner designed an addition that features an open and modern space. The spacious kitchen was designed by william draper and is graced with a remarkable center island with a hanging apple rack, an abundance of cabinetry and incomparable craftsmanship. Sure to be the centerpiece of the home, this kitchen was once featured in ~house beautiful~ and opens to a bright sunroom with a wall of windows and skylights that overlooks the beautiful outdoors. The original stone wall has open windows and gorgeous shutters that offer a pass through to the dining room where you will enjoy holiday gatherings with its rich detailed moldings, deep windowsills and built ins. Off the kitchen is a wonderful space with painted charlequin floors that would make a perfect butler~s pantry for those who love to entertain. It is connected by a formal front entry and porch. Upstairs you will find two spacious main bedroom suites. The newer en-suite has a updated bath with pedestal sink and a luxurious claw foot tub. A laundry room is conveniently found on this floor as well. Two bedrooms on the third floor each share a modern bath and epitomizes colonial charm but with modern comforts, like heat, air conditioning and indoor plumbing. You can feel its early origins in all the fine details along with a fully restored barn, a detached three car garage, a secret bomb shelter from the ww ii era, currently a wine cellar. In addition, the 1850~s carriage house has two living units along with a two car garage. A stone patio with an enchanting flowering terrace is a place of tranquility overlooking a spring-fed pond with large-mouth bass complete this hidden piece of paradise. With the preservation of all of diabase farm now in place, it will remain a semi-rural place, hidden from the public~s view, a place to follow the seasons, enjoy nature and take the time to enjoy the simpler things in life. One of the most premier lots in all of bucks county. Stunning panoramic views of the delaware river and canal. This expanded tri-level cape cod home is one of a kind custom built home by luxury home builder george parry. Home is perfectly situated on down a long driveway well off river road. Home is over 6,452 sq ft on a 3. 44 acre lot. Drive past beautiful professionally landscaped grounds which offers circular driveway leading up to home~s beautiful stone exterior and covered front porch with metal roofing over main entry. Home is a millwork masterpiece! Walk into breath taking 2-story center hall foyer with beautiful crown molding and wainscoting which carries up the entire turned staircase. Enter through beautiful french doors to formal living room on left, formal dining room to right. Beautiful rich hardwood flooring which carries throughout entire 1st floor of home. Walk past staircase leading to large open concept family room which includes an entire wall of windows which overlook the delaware river and canal. Family room flows perfectly in brand new custom chef kitchen with large island. Family room contains fireplace and sliding doors which lead to large rear deck with overlooks private backyard facing river, canal and naturalized woodlands. Kitchen contains all custom 42" white cabinets with glass shelving at top with integrated lights in each cabinet. Beautiful black granite counters with stainless steels appliances including convection wall oven and built in wine cooler. Silver mosaic tile back splash with under cabinet lighting to perfectly compliment this modern dream kitchen. Breakfast room off kitchen with large skylights allowing in plenty of natural light and 180 panoramic views of river. Left wing of house contains a first floor with library, master bedroom which includes double walk-in closets, huge master bathroom and two separate heated four-season sitting rooms. Right wing of house contains updated half bathroom, 1st floor laundry room, bonus room/mud room and inside access to 3-car attached garage. Upstairs includes 4 bedrooms and 3 full bathrooms including the au-pair suite with its own bedroom, full bathroom, additional kitchen and its own private entrance. In addition to two-story foyer, there is also a back staircase off kitchen which leads to top floor. Walk downstairs to fully finished lower level with built-in wet bar seating 5, made of rich mahogany and swing top counter for bar-back and additional fireplace. Lower level contains pool table, poker table, shuffle board which are all included in sale. Lower level also contains a home theater room, exercise room with full bathroom with steam shower and a walk out entry to huge stone patio extending the length of home boasting of a country club like atmosphere. Exterior rear decking and columns fully constructed with commercial grade top of the line azek. 3 zone hvac system (one zone for each of the 3 floors). Back of property also contains a walking path leading to private bridge connecting canal to river to access all your toys on the water in the summer months. Low taxes for property of its size and location. Home offers complete privacy one 3 sides with washing crossing state park to left and straight ahead some of the best water views in bucks county. Around the corner from bowman's hill tower. Incredible accessibility to all major highways such as 202 & i-95 to philadelphia and new york. Minutes to new hope boro and lambertville restaurants and boutiques. Homes like these do not come available often. Home is the perfect mix of luxury and elegance. This picturesque new hope stone family compound offers modern amenities, architectural character and flexible living spaces. The main house was renovated and graciously expanded, in 2013: the carriage house with two-car garage and expansive living space above and a separate three-car garage provide many options at a coveted, quiet, and private location in an estate area of new hope. A striking, freestanding, two-sided stone fireplace anchors the entry and gathering room, where wood floors, a vaulted ceiling, exposed beams, and custom entry doors set the tone for the home's living spaces. A magazine-worthy kitchen, richly finished with leathered granite counters, a stone arch over a 48" wolf range, and a convivial center island, is timeless. Enjoy the elegant-yet-comfortable dining room that opens to bluestone patio for al fresco entertaining. Just beyond is a lovely living room with a coffered ceiling and stone fireplace. French doors open to a trellised bluestone patio and to the library with a beamed ceiling. Warm hardwood floors run throughout main level. Relax in the master bedroom with juliet balcony, beamed ceiling, wood floors, spacious walk-in closet and fantastic bathroom with granite finishes, slipper-back tub and large glass shower. The upper floor is completed by three good-sized bedrooms and two decorator baths plus a laundry room. Designed to integrate with the character of the main residence, the carriage house accommodates two cars and has a wonderful, open, finished second floor with two lovely rooms. Yet more cars, bicycles or other fun items can fit in the additional three-car garage, five garage bays in all. Tall trees and enormous native rhododendrons dot the enchanting property which is just a short walk to the delaware river. 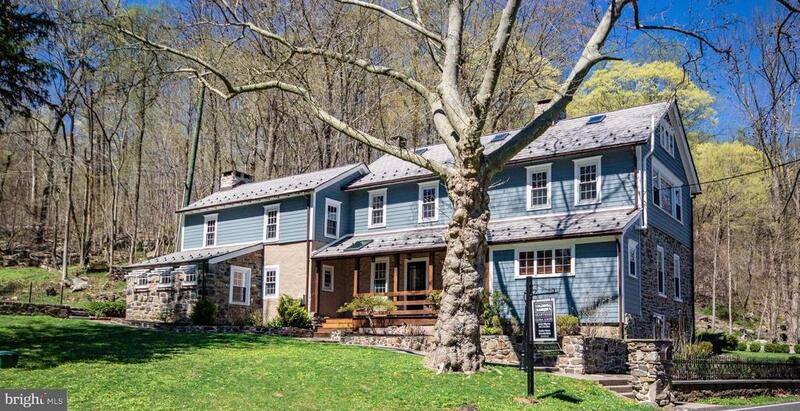 Located within new hope solebury schools, and a quick 10 minutes drive to new hope. This charming, well-built new hope estate home sits upon a private 7 acres. The property includes the residence, a 4-car garage with space above, and a carriage house. Enter through a light-filled foyer with exposed stone and custom staircase that welcomes you into the spacious gathering room. This room is complemented by charming built-in bookcases surrounding a stone gas fireplace, exposed beams and hardwood floors. The kitchen opens to an impressive dining room with vaulted ceilings, exposed beams, a large floor-to-ceiling stone fireplace and skylights that drench this space in sunlight. Curl up with a book and enjoy the outdoors in any season in the adjoining solarium, which overlooks the hillside with sweeping views of nature from every direction. French doors lead to an expansive bluestone patio overlooking an outdoor oasis and resort style pool and spa. The bedroom wing is accessed by charming stair hall. The master suite boasts exposed stone walls and elegant millwork. A full bath and dressing area accompany this retreat. The upper level features 3 additional bedrooms and a bath. The incredible living area doesn't end there! A lower level brings you to a wonderful family room with cedar cabinetry and fireplace great for billiards and play. 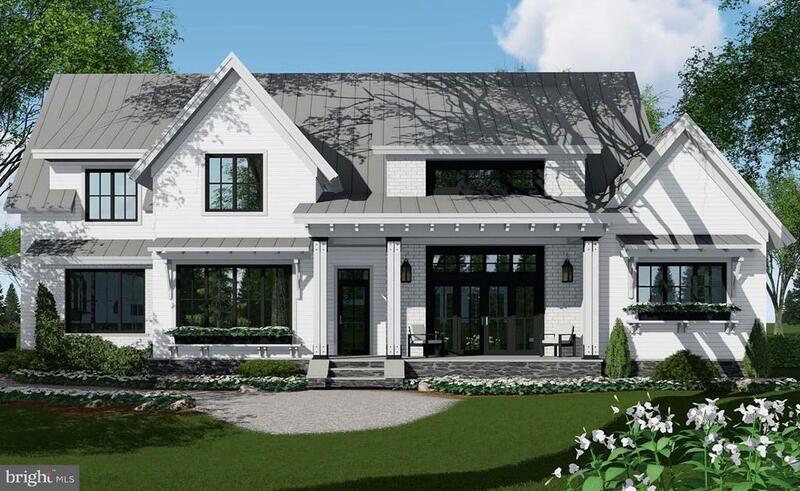 A breezeway connects with a large 4-car garage with heated terra cotta flooring & second-floor bonus room. This unfinished space provides over 1250 feet of additional living space with vaulted ceilings, a huge stone fireplace and a deck overlooking the tranquil landscape. Many possibilities for an in law or au pair suite or gym. Additionally, a custom-built, 2-story carriage house contains an office with hardwood floors, a one-car garage, and additional storage space. Recent upgrades are a new roof, refinished hardwood floors and fresh paint. The property provides privacy, lovely views and is walkable to the delaware river. Located in award-winning new hope-solebury school district, this home is a fabulous opportunity just minutes from downtown new hope and the quaint town of stockton nj. Custom built home, by builder glenn colletti, is sited on 4. 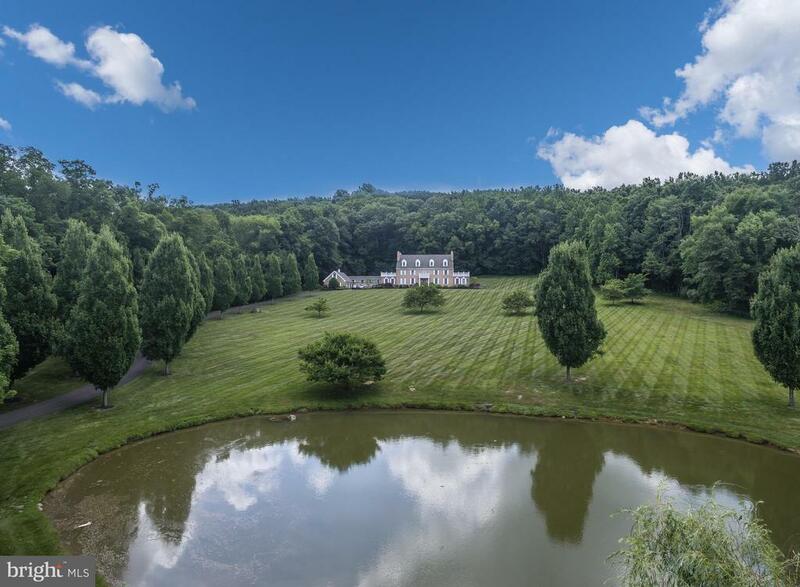 27 acres offering pristine views of the solebury countryside. The ~arbor~ model is a modest 3000 square foot house with a 3 car garage. A designer kitchen with quartz countertops, high end finishes and hardwood flooring throughout the house are just a few signature items offered by the builder. A main floor master bedroom, with an additional 3 bedrooms on the second story and 3. 1 baths makes this home comfortable for any lifestyle. The property backs to a large preserved property offering privacy and providing a wooded view. Located in new hope/solebury school district and a half mile from the charming village of carversville. Gac builders can build this home or a custom home of your choice. Don't miss out on the opportunity to build your dream home in this incredible location. This 22. 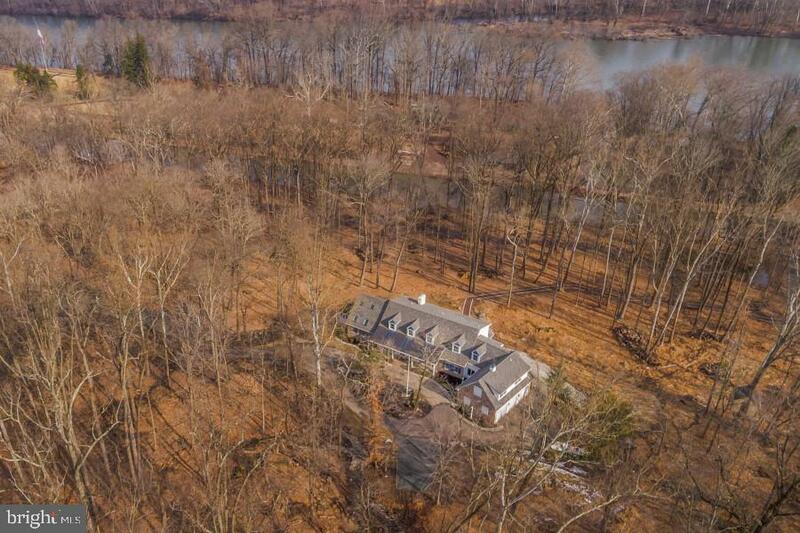 37 acre woodland setting is an ideal site for a custom home on a hilltop perch with stunning water views of the delaware river or build above the trees for a full panoramic view. No obstructions from properties below and over 1500 linear feet of hilltop ledge allow spectacular vistas up and down the river. Experience the tranquil sounds of the wing dam located directly in the center of the view from the property. Long private driveway from windy bush road will place you 1000 feet from the roadway and surrounded by for-est fauna. Enjoy total privacy while still being less than ~ mile from south main street in new hope. Access to interstate route 95 is less than 10 miles away via river road to the yardley interchange and an additional 3 minutes past that is the regional train out of yardley to philadelphia or west trenton. Property has been previously successfully perc tested in 2 locations for preliminary septic approval though updated test will be required. Build your dream home in this gorgeous and secluded setting while still being only minutes away from the active and exciting towns of new hope and lambertville. We are excited to share with you an extraordinary home enriched with modern luxury resplendent of its extensive history, poised on 8. 66 acres on the banks of the delaware river. Revered as having played an important role in the history of commerce in bucks county in the mid to late 18th century, 1791 river road once served as a lumberyard, fishery and staging point for river travel. As early as 1799, and in continuance for three centuries, the home was used as an inn and tavern - ~pidcock tavern~. Steeped in history, brought forth in modern luxury appointments and state of the art systems; the home has been skillfully renovated throughout - evident in the rich hardwood floors, walk-in fireplaces, exposed beams, gourmet kitchen and open floor plan. The distinctive main house hosts a large open gathering room, handsome dining room, gourmet kitchen with brazilian mariachi countertops and first floor en suite. Each of the four bedrooms has its own bath and staircases. Your guests will enjoy privacy canal side in a quaint cottage above the two-car garage. Modern architecture has been gracefully embraced outdoors with stone walls, flagstone patios, professional landscaped grounds and mud bottom swimming hole. Stunning river and canal views are visible from every angle. Parking is plenteous to host the liveliest of gatherings canal side or an intimate dinner party at the manor home. Only a mile to new hope borough - home to riverside dining & theatre, and exceptionally convenient to philadelphia and new york city; 1791 river road is the embodiment of cultured elegance wrapped in modern conveniences.